a little spot mural for a groovy girl named alexa. meet zeke and zoe lovebird. they've been inseparable since the day they met and no matter which one you ask they'll tell you it was love at first sight. it's a wonderful gathering of ideas and a great way to find out exactly what people think. people's suggestions could lead to more doors opening and bigger pay-offs. which brings me to my pondering as of late... the "here's what you should paint" suggestion box. i love when people offer suggestions about what i should paint. i love that they are interested. i love that their creative juices are flowing and i love that they feel a connection enough to offer up a suggestion. i hear and love every valuable input, but here's the deal... for every person there is a completely different suggestion. one thinks i should paint only animals, another thinks i should go more painterly and abstract, another thinks i should target the market and only paint only what people would "buy". what i've really noticed is that most people tend to offer up suggestions that lean towards their artistic aesthetic. my best friend loves hearts so she wants me to paint more hearts... you get the idea. well it's true, and if you try you will end up driving yourself crazy. i made the decision a long time ago to lovingly mull over everybody's suggestions but ultimately please myself as an artist. creativity flows from inspiration. i have a vision. i have an artistic voice. it's mine and mine alone and my greatest fulfillment comes when i stay true to it. something a little edgier, a little moodier. the canvas is big and has a very strong presence that i love. the women are friends of mine and the scene was patched together from pictures that i took from a recent night out. yes, they are in a limo. working on a really cool whimsical mural for a beautiful free-spirit named allie. i have been driving myself crazy trying to get the photograph of this piece to exactly represent the painting. the colors are even softer and prettier in real life... oh well, every painting looks better in person. do you earn the title when you sell something? yes. that would do it, but i believe my children are artists and they have never sold a thing. i have sold many pieces and yet still question if i deserve the title... yes, it's what i do for a living and yes, i do believe i make art, but am i an "artist"? that's why when people ask me what i do for a living i say, "i paint." the few times i have said, "i am an artist" the next question is "where can i see your work?" or "what gallery are you in?" or my personal favorite... "where do you hang?" does one have to hang in a gallery to be an artist?!? one simply has to create art. if you have ever written a poem, played the drums, decorated a room, had a child... you are an artist. we are all artists. what we do with that title is up to us. ...it's about the only thing left in boca that is. i want to be a contemporary realist when i grow up. "it's better to live one day as a lion, than a thousand years as a lab." have you ever just wanted to "get lost?" I did not like my first attempt at this painting... this was one of those that refused to come easy. sometimes a painting has a rhythm all of it's own and flows so smoothly and sometimes one comes along and it's like banging your head against the wall. I was "lost" so I decided to stop and ask for directions... one of my artist friends on twitter @artbyeve gave some wonderful suggestions that led me exactly to where I wanted to go. click on artbyeve to check out her wonderful work. you don't have to teach me, I just want to paint next to you." "it's ok. I want to paint." he said. his reminds me of the giving tree. norman can now add 'cover model' to his resume. come on... be a fan... all your friends are doing it. 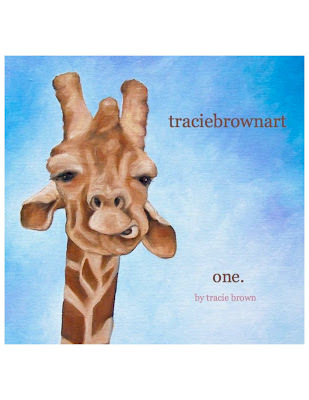 I am happy to announce the newest division of traciebrownart. prints are now available for purchase on imagekind.